This bike tour starts and ends in Prague, a historical and architectural jewel of Europe. For many it is the most beautiful city on the Continent. We will take you through southern and eastern Bohemia, a picturesque and unique region of the Czech Republic. The countryside consists of small lakes, forests, meadows, and pastoral farmland, and is studded with charming medieval towns, cathedrals, monasteries, and castles and palaces. You will get to taste the very best of Czech cuisine and, of course, Czech beer, arguably the best in the world. When you complete this tour, you will want to come back for more! We strongly recommend that you arrive in Prague a few days before the tour or stay a few days afterwards in order to explore this beautiful city. After you check-in (for those who are just arriving), we will regroup at the reception just before noon and set out for a three-hour introductory walking tour of Prague with a professional guide. In the evening, we will meet for a welcome dinner and orientation meeting. After a breakfast at our Pension, we load our bikes and board a bus that will take us to Ceske Budejovice, the beautiful provincial capital of southern Bohemia and the home town of the original Budvar (Budweiser) beer. We tour the brewery and make a short stop at the town's famous main square lined with Baroque and Renaissance buildings. Finally, we set out on the road. We bicycle through foothills with views of the Sumava Mountains in the distance, and pass the most significant monastery in the country, Zlata Koruna. We then ride on into Cesky Krumlov, a medieval town and UNESCO designated World Heritage Site. You will not find another town like this anywhere else. Cesky Krumlov was situated on the main trading route between Bavaria and Italy, which explains its splendor. We'll enjoy dinner, an evening stroll, and a night's stay in this unbelievably beautiful and town. We start today with a guided tour of the Cesky Krumlov Castle. After a short goodbye walk through town, we head northeast on winding back roads through more beautiful hamlets and some of Europe's oldest nature reserves dating back to the 1800s. Gradually, the terrain becomes flat as we enter a wooded region abounding with sparkling lakes, artificially made for fish raising (mainly carp and trout) already in the 1500's. We make our way to the center of this region, the town of Trebon, which dates back to the 11th century and was famous in the past for its fishing industry. In the afternoon, before we meet for today's dinner, you can either wander about this easy-to-navigate picturesque town and visit the beautiful Renaissance chateau gardens, then enjoy some beer at the town's 16th century Regent brewery, or you can take an optional afternoon ride with our tour guide. We leave Trebon cycling on small, almost forgotten winding country roads, passing many of the region's ponds, crossing creeks and rivers, cruising through golden wheat fields and occasionally stopping to check out some of the quaint towns and villages, their churches of various architectural styles (from Gothic through Renaissance to Baroque) and unique folk architecture. We then reach Jindrichuv Hradec, the beautifully preserved Renaissance cultural center of southern Bohemia complete with a Gothic castle and Renaissance chateau. We enjoy lunch and some sightseeing here. After our visit to this lively historical town, we set out once again on small country roads, this time through the slightly hilly, magnificently pristine countryside nicknamed "Czech Canada" for its beauty and sparse population. Cycling on the small roads, often lined with apple, birch or cherry trees, we arrive in Nova Bystrice, a small, charming town where time has stood still and where we spend the night. As it is only 3 kilometers to Austria, you may wish to take a short afternoon ride. Today offers so much to see... There are some climbs on the way but the rewards are more than worth it. First of all, after a short bike ride from our hotel, we visit the Gothic Landstejn Castle built in the 12th century as a fort. The spectacular views of "Czech Canada" from the top of the castle's watchtower are worth the climb. If we are lucky, we may even be able to shoot some mediaeval crossbows on the castle ground. 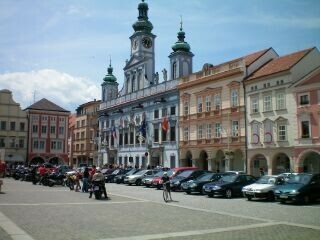 Next we ride to Slavonice, one of the best preserved historical towns in Europe and nicknamed the Renaissance Pearl. We visit the town's main Renaissance square and have a coffee in a café whose building dates back to the 1500's. Very famous pieces of local pottery can be seen (and purchased) in the café itself or in the gallery adjoining the café. 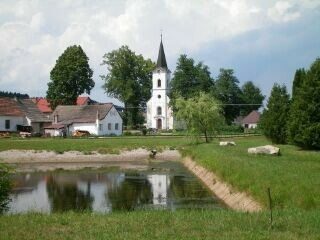 Another Renaissance town on the way is the town of Dacice, with its beautifully renovated chateau in the Empire style. We suggest you take a lunch break here and enjoy a delicious meal in one of the restaurants on the town's lively square. Today's route ends at the remarkable 13th century town of Telc. We have a guided tour of the splendid local Chateau scheduled for the afternoon. In the evening, you can take a stroll around the magnificent main square and have a beer or glass of wine in one of the charming restaurants or cafes. We leave Telc and travel along the small roads of the lovely Moravian Highland, passing the ruins of Rostejn Castle, visiting renowned Trest with its synagogue and rich Jewish history dating as far back as the 1200's. Franz Kafka used to live in Trest and there is an exhibition on Kafka and Jewish history in the synagogue. From Trest we head north through the splendid countryside of the Highland, riding mostly on small, often almost traffic-free roads, enjoying the pristine nature, valleys, forests, and small towns and villages, as always with lots of local churches and other historical monuments to see. After a day of spectacular nature, we arrive at our final stop for the day - Humpolec - for centuries the center of the surrounding silver mining and textile industries. Humpolec also has the last brewery in the Czech Republic where beer is made the old, traditional way - without pasteurization. The locals swear it's the best beer in the world. You can try it for yourself - it's called Bernard. Heading north through the Vysocina region, we'll follow the Sazava River into charming Ledec, where you can enjoy lunch and explore its Baroque castle and town center. 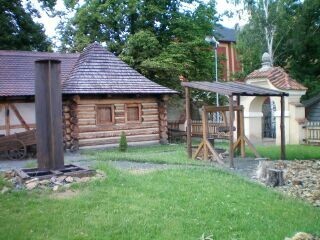 Ledec is also home to the oldest Jewish settlement in Bohemia. Passing many colorful villages and wide vistas of meadows and fields, we finally arrive at fascinating Kutna Hora, yet another UNESCO World Cultural Heritage site. 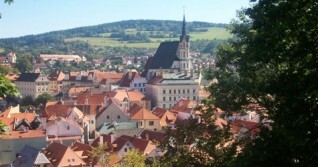 This medieval town rivaled Prague in wealth during the 15th century due to its silver mines and coin minting industry. The dollar got its name from "tolars", which were minted here. We have a guided tour of this amazing town scheduled for the afternoon. The tour includes a visit to the imposing Cathedral of St. Barbara located in the center of town. In the morning we visit the nearby Ossuary, a small chapel decorated with over 40,000 human bones dating back to the Plague in the 15th century. 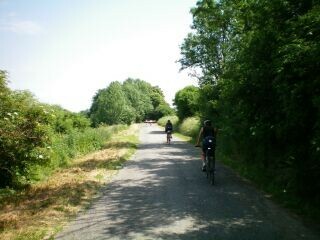 Our final day of cycling takes us back to Prague through the wheat fields of the Bohemian countryside. Along the way we take a break to visit the very unique outdoor museum of folk architecture in Kourim. We will ride into Prague, and time permitting, enjoy some more sightseeing before a farewell dinner together. After breakfast at our lodging, we depart for home (except people who have opted to stay longer in Prague). Shuttle service to the airport is available in the morning. Have a save trip home! The southern Bohemia terrain is moderately rolling with some hills along the way and a few climbs. An intermediate cyclist should be able to comfortably complete the average 60-85 km/ 40-50 mile days. We design most of our route along small, quiet, and picturesque roads with little car traffic and/or bike paths that enhance our sightseeing of the local areas. For the most part, road surfaces will be of very good quality, however there are a few sections with rougher, patched surface. Prague is serviced by Vaclav Havel Airport, located just west of the city center. There is both public transportation and reasonably priced shuttle service available from the airport to Prague. Your trip Welcome Letter will provide detailed directions to our lodging in Prague and instructions how to use public transportation or secure a shuttle ride from the airport. Your rental bike comes with a rear luggage rack, bungie cord, extra tube and levers, water bottle cage, pump, lock, and odometer. The price for renting a bike for this tour is $180 for Fuji Absolute or $220 for Fuji Newest or Fuji Roubaix.